At this point in time, I was too lazy/impatient to take nice pictures of my cards. Will be fixed eventually! 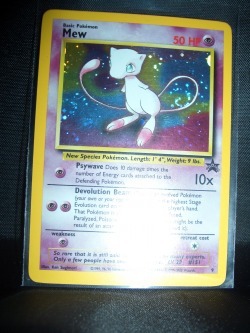 Ah, my Mew TCG Collection. 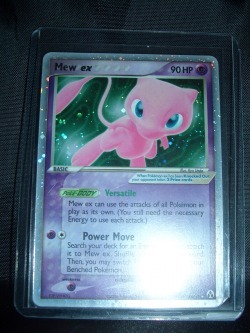 When I decided I wanted to collect some of Mews cards, I originally wanted to just get the English ones, because I figured I would never be able to get my hands on the beautiful Japanese ones at a decent (cheap) price. However, I had a bunch of luck with them, so I decided to go for them all! However, I collect only one of each card / the English version if applicable. Getting all the releases would kill my wallet! 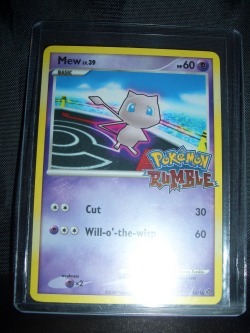 I'm currently missing 3 rare Japanese cards, and waiting to see if Mew Prime makes its way into an English release before I seek out the Japanese version instead. 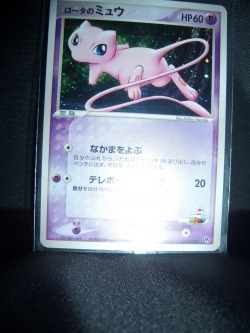 I've also been told that the Japanese Pokemon Cards are much better quality than their English counterparts, but I like being able to read the attacks and such XD; Oh well. I was VERY cheap with getting all these cards. 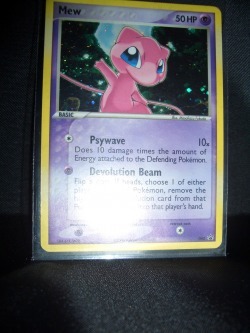 Sometimes I waited for months to get a certain card, even though it was all over eBay. 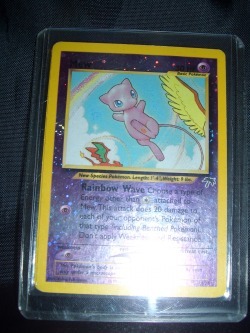 I used to keep a Word Document open with ending prices of every relevant card that passed through eBay :P I was determined to get great deals on these guys, because the money added up very quickly. 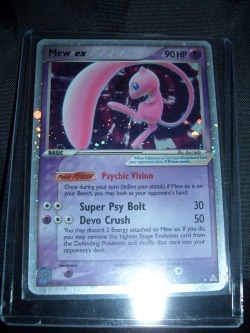 The most I spent on a card was about $12.99 shipped, for the Mew *. I wish I could afford to buy the expensive ones! Another thing I should mention is that the majority of these cards are in Mint condition, and the few others are Near Mint. Anyway, onto the cards! 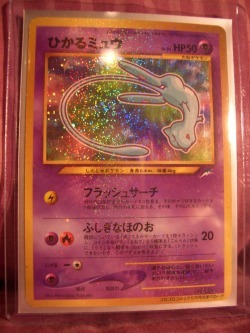 Another crappy picture of a beautiful card. 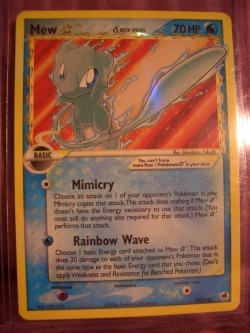 I love the blue Mews, and I really love the holo style of this card. 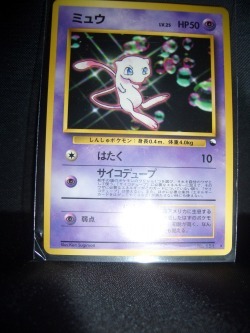 A shiny, shiny Mew! I waited for MONTHS before I found one for a good price. I spent a little bit more than I usually would for this card, but it was totally worth it. I got it a few days after I got home from my Spring `10 semester, and after all the stress and finals I went through, it was really great to receive something in the mail that I had been after for so long that I really really wanted. 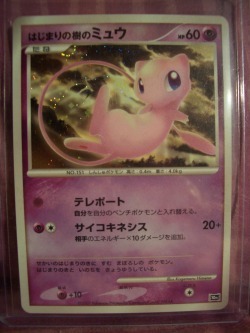 Yup, this card is another of my 3 favorites. Thank you eBay! Love the art of this whole collection! 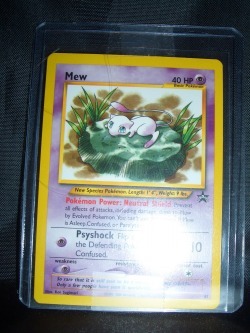 This card was a cheap BIN on eBay. It was actually for two, so there's actually another one in that card case. 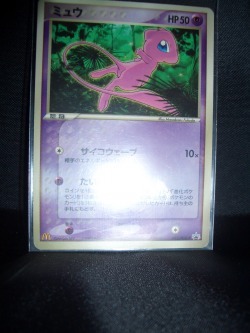 This one I actually bought from a very nice member from PokeBeach! 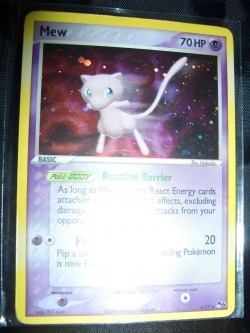 This and my Large TOMY Mew figure were my 2nd purchase from pkmncollectors! 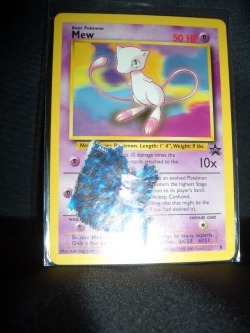 When I was little, I someone acquired that ripped out picture of Mew from Pokemon Stadium, and its been sitting in this card's plastic sleeve ever since. 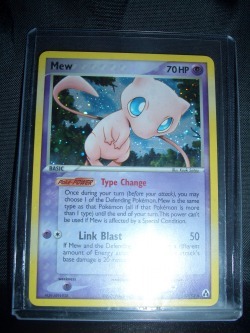 Actually got this one with the Derp Mew plush I found on eBay lol. 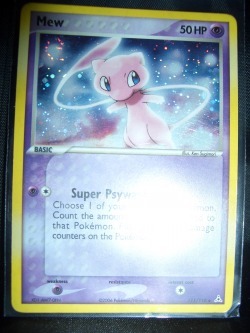 This card I actually got in one of those silly "WITH BONUS PROMO" packs from Walmart. 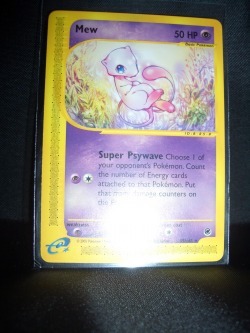 I was "that guy" (or I supposed "that girl") who stood in the aisle and shook the packaging and squinted sideways to see what promo card was hidden behind the pack. Hah. 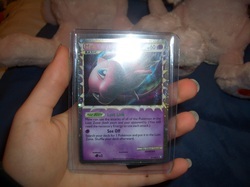 Here it is, my very first purchase from pkmncollectors, and the first use of my Paypal account! I was a total oblivious idiot and sent the money as an eCheck. I'm very thankful that pacificpikachu was so patient with me! 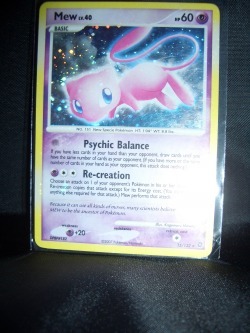 I haven't really seen this card around too much, so I'm glad I got it when I had the chance! 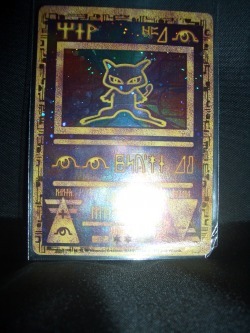 This one came from a Group Auction on pkmncollectors. Oh boy. 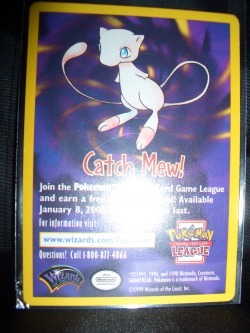 This damn card has a history. In short, I won a mint one off eBay in February 2010 for about $9.60 shipped, and I never got it. Waited 42 days for it, and eventually got a full refund. 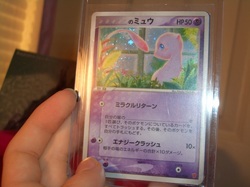 Since then Ive seen a few up for auction or sale, but always around $30 which is totally beyond my "card budget". I really thought I would never get a chance at this card again. 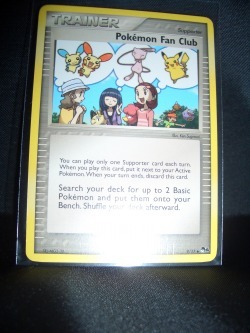 Now here we are in September 2010 and with a massive stroke of luck, I won a mint/near mint one for $15 shipped on eBay! (Then of course, in my excitement I accidentally submitted the wrong address, and had to message the seller to change it XP). 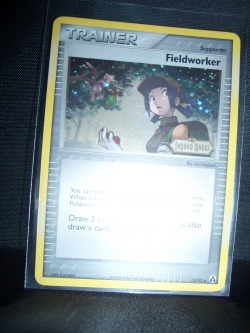 Finally, I have this card in hand (literally)! 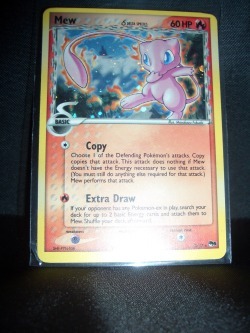 This came from eBay too, but the cool thing about this card is that the front is glossy! Yup, that would be Mew in the tree.